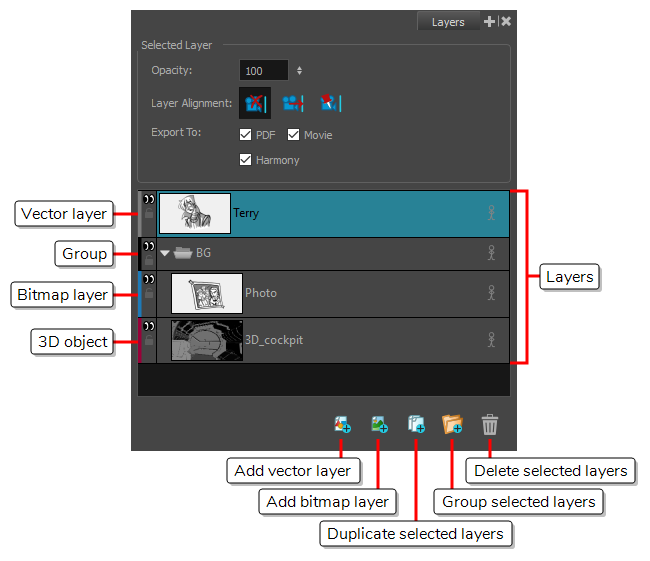 The Layers view is where a scene’s layers are superimposed to form the final image. For tasks related to this view, see About Layers. ‣ In the Panel view, click the Add View button and select Layers. Allows you to adjust the opacity of the layer, to make it opaque or semi-transparent. NOTE If you change the alignment of a layer from Pin to Camera to No Alignment, its animation will be discarded and it will be in the position it is at the current frame throughout the panel. If you change the alignment of a layer from No Alignment to Face Camera, its offset and scale transformations and animations will be preserved, but not its rotation angle transformations and animations. If you change the alignment of a layer from Pin to Camera to Face Camera, its animation will be discarded and it will be in the position it is at the current frame throughout the panel. NOTE When changing the alignment of a layer to Pin to Camera, all its transformations and animation are discarded. For more information, see Aligning 2D Layers with a 3D Camera. PDF: If enabled, the selected layer will show up in the exported document when you export your storyboard in Photoshop Document (.pdf) format—see About Exporting to Portable Document Format (.pdf). Movie: If enabled, the selected layer will appear in the exported image when you export your animatic as a movie or as an image sequence—see About Exporting Movie Files. Harmony: If enabled, the selected layer will appear in the exported scenes when you export your animatic as Harmony scenes—see Exporting Harmony Scenes. Layers The list of layers in the current panel.